Thanksgiving weekend is the traditional opening of the blockbuster Christmas movie season, which means not only new films but new trailers and more promotion. 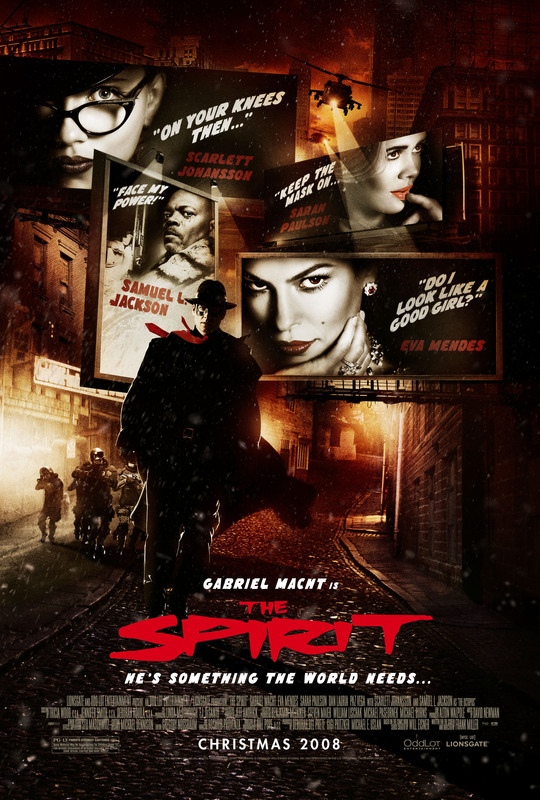 The Spirit, for example, which opens on Christmas Day, has released a new poster, shown here, as well as a couple of videos. There’s a mashup video combining elements of the trailers from The Spirit, Punisher: War Zone (due December 5), and Transporter 3 (out on Wednesday). Pretty cool, with neat music. You’ll probably want to watch it more than once, just to figure out what’s coming from which film. Plus, here’s a three-minute featurette on “The Women of The Spirit”, which reinforced for me that hearing some actors speak isn’t good for the mystique of their character, especially if they’re playing legendary emblems of the femme fatale. I wish I was more excited about this movie — I’m uncertain about how well the extreme stylization will work for the material, which I would prefer to see done in a more retro fashion — because it’s great to see so many women. Morgenstern is my new favorite, for a simple reason: based on the short glimpses so far, her character is about what she does more than her appearance. (The rest are all eyes and lips and being on display to be looked at, which makes for pretty pictures but makes me uneasy.) The Octopus, though, as played by Samuel L. Jackson in much too much mascara, is laughable, which I don’t think is the intent. That character was scarier as someone we never saw in the comics. Is Frank Miller the weak link? He is, after all, the one responsible for writing Robocop 2 and 3. Or is it too easy to slam on the guy responsible for The Dark Knight Strikes Again?